As a December 26th baby, I feel a special connection to Christmas- even if a birthday at this time of year is pretty underwhelming. Coupled with my love of repurposing and upcycling, it should come as no surprise to anyone that combining the two- Repurpose/Christmas- is something I look forward to each year. And while I haven’t done that many of them, repurposed ornaments are an exceptional favorite. But there are SO MANY amazing ideas out there! From upcycling Jell-o molds, to fabric like sweaters and quilts…to broken jewelry and even furniture finials! Repurposed ornaments are the perfect Christmas craft project to work on indoors when the weather is cold during the holiday season. But upcycled Christmas ornaments are even MORE fun to create. 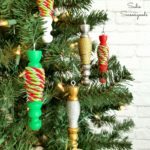 So, I’ve gathered some of my favorite repurposed ornaments / project ideas around, in hopes to inspire your festive creativity! I don’t know if I can pick a favorite, but there are definitely a few contenders. Which one is your fave?? And will you be creating any handmade Christmas ornaments for the tree this year? And before you go, please check out my full collection of upcycled / repurposed Christmas craft projects here! This makes me not want to throw anything out…lol. I love the spray can cap drums and will have to try that one. I love all these ideas, the trouble is our tree is already bursting at the seams! I was given some broken but really elaborate Indian hand jewellery from a friend once (my friends are well trained and all know I’ll take their old broken stuff to repurpose) and made some of it into tree ornaments, some was used on cards and some is still in my stash waiting for more inspiration! Oh, I bet that jewelry is gorgeous- would love to see those ornaments! Love these ideas, the vintage jelly mold is so cute and the recycled Christmas card trees so simple but very effective. Thank you for featuring my angel shuttlecocks in this great roundup. Thank you for being a part of it, Claire!! Sarah, Thank you for including my vintage card tree ornaments in the roundup. This is one of the best DIY project roundups I’ve seen. I love them all. Not enough time! Merry Christmas! Thank you for being a part of it and sharing!! I love the clocks! thanks for sharing on the Pleasures of the NW’s DIY party! No way to pick a favorite, because they are all fabulous ideas! I definitely pinned this one to look at and start the new year with an idea or two. Thank you for sharing and have a fantastic creative day! There are some good ones in there, eh??? Merry Christmas! Love all the vintage Christmas prints! Great ideas. Visiting from Inspire Me Monday party. Wonderful ideas that I will bookmark . Like a previous comment now I better not throw anything out!!! Thanks for sharing. Hahaha! 😉 Thanks so much, Barbara! Wow, I don’t think I saw an idea I didn’t like! Love the trees made out of old Christmas cards b/c I save all that stuff. Pinning for next year! such an awesome idea! I love upcycling things – eco living is so wonderful and it’s amazing the things you can do with old items! happy holidays! Sarah, a wonderful round up of vintage and repurposed items for Christmas ornaments. Love them all. Thank you so much for sharing at Vintage Charm. Thanks so much for including my Christmas Drum in your round-up. Happy New Year! Cheers.